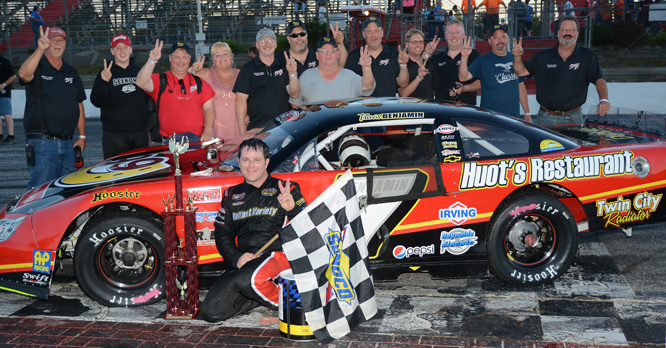 Oxford, Maine – Travis Benjamin nailed down his second consecutive Pro All Stars Series North Super Late Model victory Sunday night at Oxford Plains Speedway. Benjamin, in the Petit Motorsports 7, needed most of the race distance to mount a challenge to Cassius Clark of Farmington, who dominated most of the race driving the Nova Scotia-based King Racing entry. Benjamin moved alongside Clark for a late-race restart and was able to prevail from the outside groove. Glen Luce of Turner also got by Clark in the waning laps to earn a second-place finish after a couple of disappointing weeks saw him ousted from the series championship lead. Clark ended up with a third-place finish and some optimism about returning with the car for the 44th Oxford 250 coming up on Sunday, August 27. Waterboro’s Curtis Gerry was the fourth-place finisher, with Auburn’s Travis Stearns earning his first top-five Pro All Stars Series finish. Joey Doiron of Berwick was sixth, followed by Derek Griffith of Hudson, New Hampshire. Massachusetts racer Derek Ramstrom was eighth, followed by Dave Farrington, Jr. of Jay and Pittsfield’s Chad Dow. Clark, Stearns and Benjamin posted victories in 15-lap heat races. 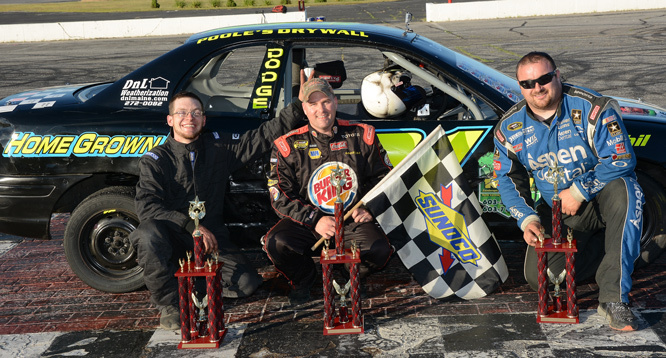 Andy Shaw of Center Conway, New Hampshire prevailed in the 40-lap feature race for the PASS Mods. Shaw, a five-time champion in the class, quickly worked his way through traffic from his 11th starting position to get by early leader Mark Lundblad, Jr. of Conway, New Hampshire. It was Shaw’s second consecutive win and his second win this season. 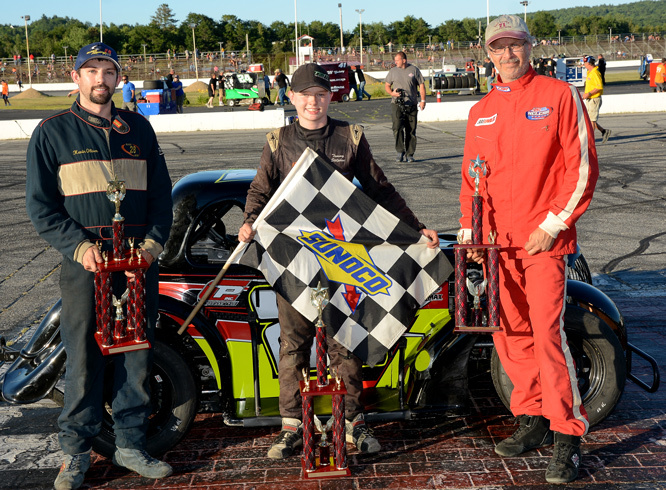 Current PASS Mods championship leader Ben Tinker of New Gloucester earned runner-up honors, his second straight runner-up performance after winning the first five races this season. Tinker started the race from 12th position. Scott Alexander of Glenburn started 10th and finished up in third spot. Lebanon’s Mike Carignan and Lundblad rounded out the top five. Jamie Heath of Waterford aced the first round of a special triple crown series for the Oxford Plains Speedway Bandits division. Heath, the reigning track champion in the class, waged a race-long battle with another former champion, Shaun Hinkley of Oxford, who had to settle for runner-up honors. Kyle Hewins of Leeds was a distant third-place finisher in his Joe Dirt 52. Auburn’s Scott Jordan and Chachy Hall of Oxford rounded out the top five. Hinkley and Heath won heat races prior to the 20-lap main event. Defending track champion Austin Teras of Windham outran Peter Craig of Poland in the Legends Cars 15-lapper. Gray’s Kevin Oliver beat out Colby Benjamin of Belmont for third-place honors. The next Pro All Stars Series North Super Late Model race is scheduled for Friday, August 4 at Lee USA Speedway in Lee, New Hampshire. For more information please visit proallstarsseries.com or call (207) 539-8865. Pro All Stars Series Super Late Model 150 (150 laps) 1 7 Travis Benjamin, Morrill, ME; 2 7 Glen Luce, Turner, ME; 3 13 Cassius Clark, Farmington, ME; 4 7 Curtis Gerry, Waterboro; 5 16 Travis Stearns, Auburn, ME; 6 73 Joey Doiron, Berwick, ME; 7 12 Derek Griffith, Hudson, NH; 8 35 Derek Ramstrom, West Boylston, MA; 9 23 Dave Farrington, Jr., Jay, ME; 10 2 Chad Dow, Pittsfield, ME; 11 59 Reid Lanpher, Manchester, ME; 12 24 Mike Rowe, Turner, ME; 13 60 DJ Shaw, Center Conway, NH; 14 4 Ben Rowe, Turner, ME; 15 48 Bobby Timmons, Windham, ME; 16 27 Wayne Helliwell, Jr., Dover, NH; 17 97 Joey Polewarczyk, Jr., Hudson, NH; 18 54 Johnny Clark, Farmingdale, ME; 19 03 Joe Squeglia, Derry, NH; 20 47 Kelly Moore, Scarborough, ME; 21 8 Calvin Rose, Jr., Turner, ME; 22 50 Jeff White, Winthrop, ME; 23 73 Adam Polvinen, Hebron, ME; 24 71 Gary Drew, Casco, ME; 25 10 Kyle DeSouza, Williamstown, SC; 26 72 Scott Robbins, Dixfield, ME; 27 41 Tracy Gordon, Strong, ME; 28 61 TJ Brackett, Buckfield, ME; 29 0 Scott Luce, Strong, ME; 30 20 Mike Landry, Oakland, ME. PASS Mods (40 laps) 1 0 Andy Shaw, Center Conway, NH; 2 19 Ben Tinker, New Gloucester; 3 17 Scott Alexander, Glenburn; 4 21 Mike Carignan, Lebanon; 5 25 Bruce Helmuth, Wales; 6 28 Mark Lunblad, Jr., Conway, NH; 7 60 Gary Shackford, Center Conway, NH; 8 14 Jon McCarron, Etna; 9 16 Patrick Sullivan, Poland; 10 64 Matty Sanborn, Windham; 11 2 Randy Sanborn, West Baldwin; 12 5 Devin Curit, Saco; 13 12 Jimmy Emerson, Windham; 14 44 David Grystwicz, Standish; 15 85 Jariet Harrison, Freeport; 16 27 Henry Sirignano, Abington, MA. 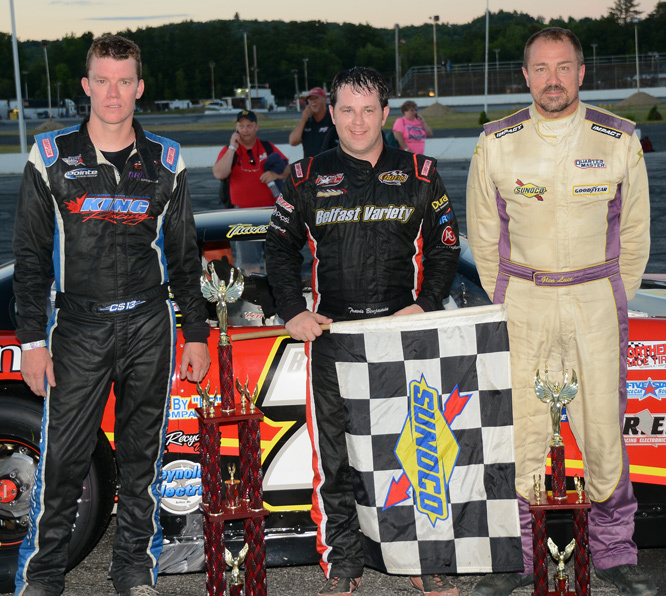 Bandits Triple Crown (20 laps) 1 91 Jamie Heath, Waterford; 2 2 Shaun Hinkley, Oxford; 3 52 Kyle Hewins, Leeds; 4 36 Scott Jordan, Auburn; 5 3 Chachy Hall, Oxford; 6 51 Adam Sanborn, West Paris; 7 08 Mike McKinney, Berlin, NH; 8 24 Travis Verrill, South Paris; 9 53 Dustin Salley, Poland; 10 23 Eric Parlin, Mechanic Falls; 11 39 Randy Henderson, Buckfield; 12 4 Dave Brennan, Winthrop; 13 1 Brandon Varney, Auburn; DNS 29 Mike Gooden, Whitefield, NH; DNS 777 Mike St.Germain, Auburn. Legends Cars (15 laps) 1 29 Austin Teras, Windham; 2 4 Peter Craig, Poland; 3 28 Kevin Oliver, Gray; 4 52 Colby Benjamin, Belmont.